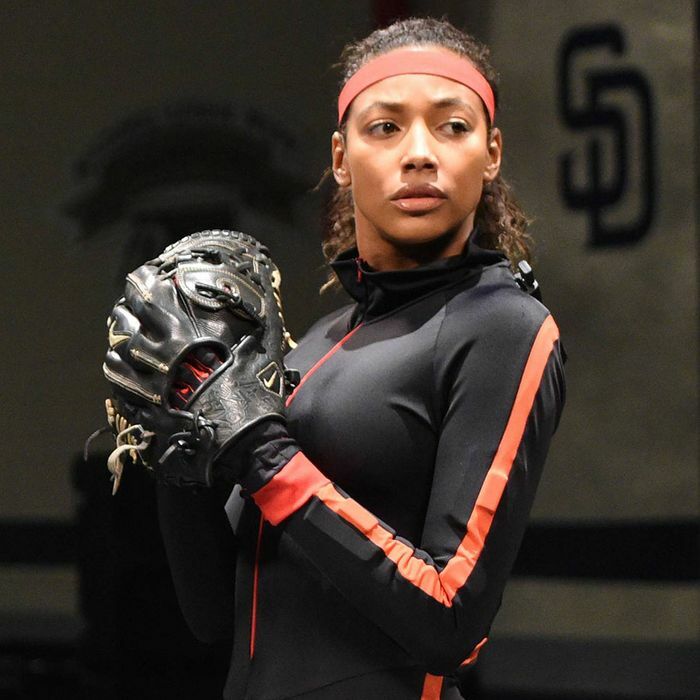 If Fox is foolish enough to let Pitch go, hopefully another network or platform will recognize the value of a show with Kylie Bunbury as its lead. Tonight’s season finale ends as if it’s preparing us for a second season, and I’d certainly like to see that happen. The show’s impressive depictions of strong, sensitive women would play a valuable role in the coming years, especially after the loss of Abbie Mills on Sleepy Hollow. The morning after Ginny’s date with Noah (and later, Mike), Evelyn arrives at her hotel room looking for details. When Ginny says things got weird, it only piques Evelyn’s curiosity more. Is he a Fifty Shades of Grey kind of billionaire? Ginny confesses she left the date to go be with Mike, and Evelyn becomes a living “big eyes” emoji. She wants all of the electrifying and specific details like, “Does the carpet match the face?” I love this whole scene between the two of them. Ginny confides in someone she trusts and Evelyn gets such a kick out of the girl talk. Amelia interrupts them to get Ginny’s day started, and it’s only a little awkward, considering Amelia’s past with Mike. Speaking of awkward, Mike and Ginny don’t know how to act around each other after their almost-kiss. The situation is exacerbated when Rachel, Mike’s ex-wife (who recently broke up with her fiancé) arrives to interview Ginny. Mike freezes when he sees the two of them together. It’s funny and cute, but does he really think Ginny would spill the beans? She has even more to lose than he does if anyone pieced together that she and the team captain almost went there. Ginny decides to reach out to Noah again, but when he doesn’t answer her text after 20 minutes, she has Eliot track him down at a café where he’s singing and playing guitar. It’s a little bit of a stalker move, but Ginny knows what she wants. Noah sees her and the two exchange loaded looks. Ginny really likes this guy — good for her! Her feelings for Mike may be a little muddled, but she’s not sitting around pining. Ginny and Noah go for a walk and tell each other how they managed to arrive at their respective moments in their careers. Ginny’s father instilled in her the mantra “endure, endure, endure.” Noah failed often and realized that trying not to make waves was his big mistake. The two end up at in Ginny’s hotel room and the next morning, Noah suggests they go on vacation together. Ginny doesn’t know what destination she wants because she’s never really been anywhere. Noah says, “Let’s go everywhere.” He’s got a plane and a boat. Anything is possible. #Bawson may be the ‘ship that keeps this show afloat, but Noah knows how to make a girl swoon. Paparazzi get pictures of Ginny and Noah kissing, and just like her teammates, I’m glad Ginny’s finally getting some. It would’ve been easy to pull the trigger on her and Mike, but Pitch seems to be moving away from that. Above all, they’re teammates. Bringing them together too soon, if at all, could be damaging to the clubhouse that’s only now getting back into shape after Ginny’s arrival and Mike’s return. Blip is still resentful of Mike initiating the trade and feels insulted that Mike didn’t push to end it. He’s also angry that Evelyn still wants to open her own business. She was upfront about Will’s embezzling, but she has goals she wants to pursue and they don’t include having any more children. Blip thinks no one is thinking about what he wants, completely overlooking the nine years Evelyn has sacrificed to make sure his professional goals were a priority. Evelyn is such a great character. At first, I was concerned that she was going to be a Real Housewife parody, but she rounds out a cast of strong, supportive women on the show. She’s a great wife, mother, and friend, but she’s also looking out for herself and refuses to be denied, whether it’s gossiping about a friend’s date or going after her professional dreams. Pitch has a wide range of smart, talented women surrounding Ginny: Amelia, Evelyn, and even Rachel. For the young women and girls who are watching, it’s important to see these strong depictions of women, and it’s yet another reason why Pitch needs to remain on air. All of the interpersonal relationship drama, including Ginny’s confrontation with Will about stealing money (and with Amelia for getting involved in family business) leads to what may be her last game of the season. Oscar’s favorite Ross has crunched the numbers and Ginny has thrown her signature screwball so much, they need to sit her down or she’ll wear out her arm. Ginny points out that women’s ligaments are different and therefore she has increased flexibility, but Oscar doesn’t care. The math is what’s important. It’s a nice way to highlight how women athletes need different physical considerations. The front office compromises to let Ginny have one more start and she’s close to pitching a no-hitter, even though baseball’s unspoken rules decree that no one is allowed to say it’s happening, lest they jinx it. Blip and Mike get into a shoving match and Al hopes it doesn’t affect Ginny’s game. She goes back to the mound and throws some wild pitches. She also gets a little woozy, which is concerning, but she shakes it off. Mike approaches her, prepared to give one of his big pep talks, but Ginny shuts him down. All her anger about Will, Amelia, and the awkwardness between her and Mike finally spills over. She gives her own speech, saying she doesn’t need a man to rescue her — not the ghost of her father, not Noah who wants to whisk her away, not Mike and his big movie speeches. She throws the ball, so she gets to give the speeches. She’ll decide if they talk about their almost-kiss, not him. Her rant sets Mike back on his heels, and it does the trick. The Padres get the strikeouts they need, but Ginny gets hurt along the way. She’s cradling her elbow as she’s escorted off the field. The episode ends with Blip sleeping on the couch, Mike praying as he watches coverage of the injury, Amelia boarding a plane after she’s effectively fired, and Ginny entering an MRI machine. It certainly feels like Pitch is laying groundwork for a second season, but as Rachel reported earlier, “Even if Ginny is a short-term anomaly, she’s left her mark on history.” We need shows like Pitch on the air, and I absolutely hope it comes back next year. If Ginny and the gang don’t return, though, they’ve still opened up the world of baseball and done a great job of showing strong, vulnerable women who endure both personally and professional. They’ve made their mark on television history.